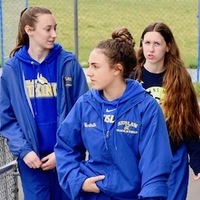 Siuslaw sophomore Gracie Freudenthal, junior Ryan Rendon-Padilla and senior Naomi Shoji grabbed titles Saturday in the Marist Track Classic in Eugene. Freudenthal won the girls 100-meter hurdles In 16.07a seconds and placed fourth in the 300 hurdles in 49.03a. Rendon-Padilla won the boys javelin at 172 feet even and placed sixth in the discus at 111-11. Shoji won the girls 400 in a personal-record 1 minute, 5.01a seconds and finished 11th in the 800 in 2:43.20a. Vikings boys setting personal bests included junior Isaiah Jones in the 200 and triple jump, sophomore Ryan Jennings in the 800, junior Kiger Johnson in the 1,500, freshman Chad Hughes in the 3,000, sophomore Skyler Loomis in the discus and javelin and freshman Braydon Thornton in the long jump and triple jump. 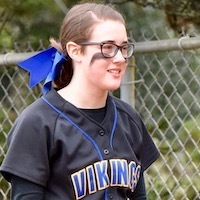 Vikings girls with PRs included freshman Julia Shoji in the 400 and long jump, freshman Rylee Colton in the 800, senior Davina Galli in the 100 hurdles, senior Alyssa Richards in the javelin, freshman Maisie Jones in the javelin, high jump and long jump, junior Brooklyn Cahoon in the long jump and junior Bryn Clement in the triple jump. Ten schools competed, with the Vikings girls placing fifth and the boys seventh. Jesuit, a 6A school, won both team titles. 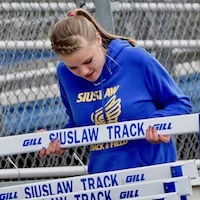 Siuslaw next hosts a Sky-Em League JV meet Tuesday at Hans Petersen Field. Friday-Saturday, May 17-18— OSAA Class 4A state championships, Mt. Hood Community College, Gresham.